The 750 square foot, 30-foot-wide and 6-foot-tall Octagon™ was created with both safety and fairness in mind. The reason the UFC® uses an Octagon instead of a ring is for fighter safety. When competing in a ring, a fighter can fall out or get thrown out. 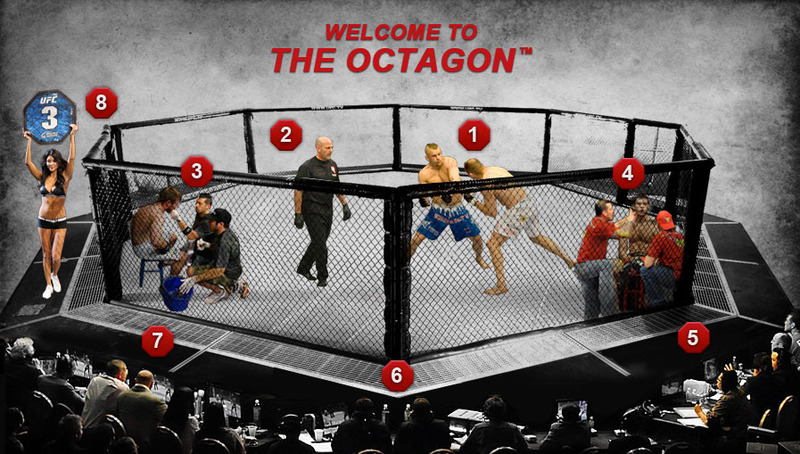 In the Octagon™, a fighter may find himself pressed up against the fence, but he won't fall out. The walls and padded surfaces protect fighters from falling out and the wide angles prevent fighters from getting stuck in a corner with no way out. Since boxing is fought in a square ring and wrestling in a circle, the Octagon™ avoids giving any one martial arts discipline the advantage with so many different fight styles entering. Between rounds, both gates are opened to allow the cornermen and cutmen to enter the area, but while the fights are in progress, only the two fighters and one referee are allowed inside the Octagon™. This is where fighters prove themselves with toughness, diversity and athleticism. Step inside the Octagon™ yourself and hold the Championship belt with UFC VIP Experience access! The Octagon™ has a blue corner and a red corner, and fighters are assigned to each. They wear blue or red tape around their gloves to indicate which corner they are in for the particular bout. After making their entrance, the opponents wait in their respective corners until the ref starts the fight. One referee is outside of the Octagon™ before the fight to inspect the body for any foulplay and to ensure that the fighter is wearing a cup and mouthpiece. Once a fighter has been inspected, they must immediately enter the Octagon™. There is one referee inside to enforce the rules, instruct the fighters and, if necessary, stop the fight. Cutmen are not chosen - they are assigned to either the red or blue corner and work with whichever fighter is in that corner for the night. Before the fighter goes into the Octagon™, a cutman applies vaseline to the the eyebrows and cheeks, which are the areas prone to cuts. The cutmen don't touch the athletes between rounds unless a fighter is cut or has facial swelling. Cornermen are there to motivate and provide instruction between rounds and they are usually part of a fighter's training camp. Only two people are allowed to enter the Octagon™ for each corner, so if a cutman is required, only one of the cornermen can enter between rounds. The cornermen also massage muscles, apply ice and provide water if necessary. Three licensed judges score each round of every fight in case both men are still standing in the end. In these cases, the fight goes to decision and the winner is determined by the judges' scores. Joe Rogan and Mike Goldberg or Kenny Florian and Jon Anik commentate on the fight from Octagonside. Once the fight is over, Joe Rogan or Jon Anik will enter the Octagon™ and interview the fighters. Commenter Joe Rogan knows his stuff - he holds a black belt in Brazilian Jiu Jitsu, a black belt in Tae Kwon Do, and a blue belt in Judo. The UFC Execs watch the event from Octagonside. They decide who wins Submission of the Night, Knockout of the Night and Fight of the Night and present the bonuses to fighters at the end of the event. These babes holding the numbers are there for more than just eye candy - they remind you of what round it is. One girl circles the outside of the Octagon™ holding the number between rounds.